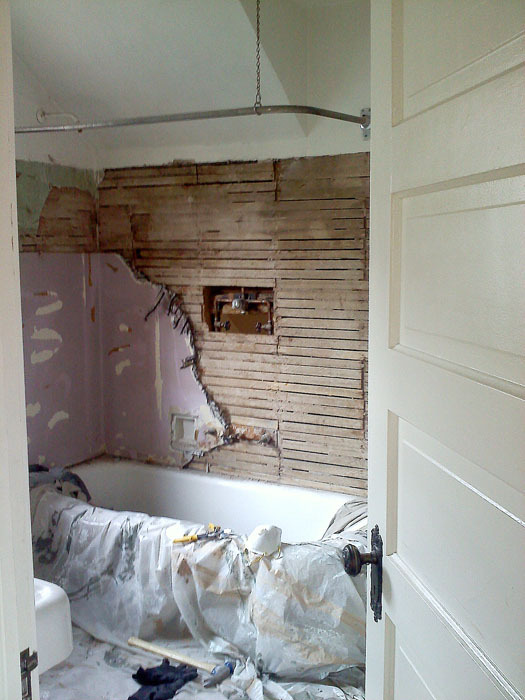 So after settling in, we got started “redoing” that bathroom. 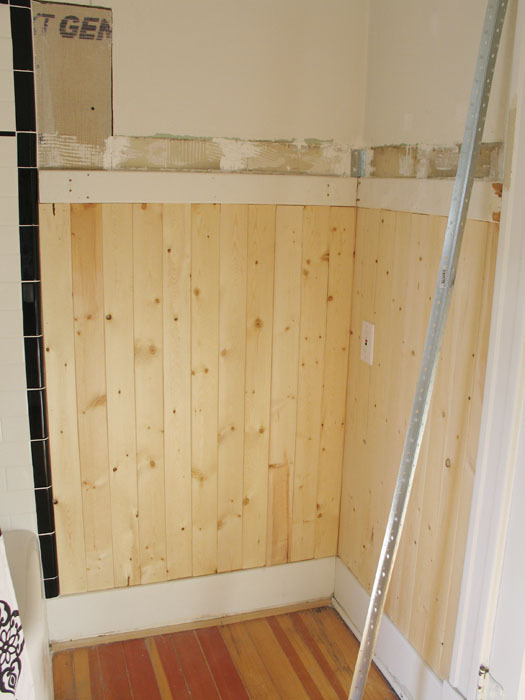 After the tile, we installed beadboard wainscoting. 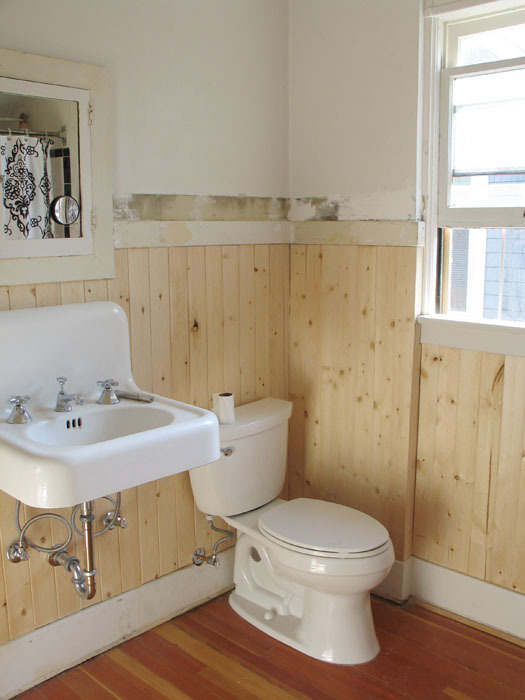 For more information on wainscoting — maybe even more information than you ever wanted — the This Old House people have an awesome slideshow. We had a choice between paneling or individual slabs, and we chose the slabs because we thought they looked better, more traditional. 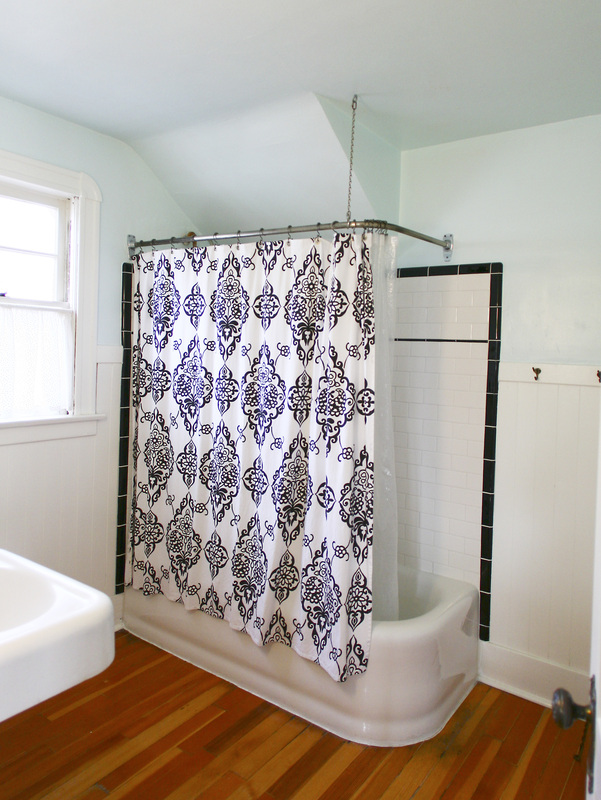 Add a little paint, clean up the hardware, hang a few brass hooks that were nearly impossible to find, and you can consider that a redone bathroom. See that soap tray on the main panel there at the top? 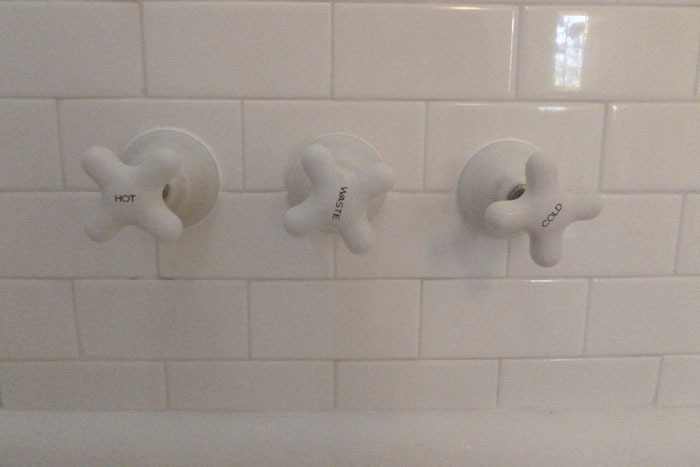 Yeah, the one that can't hold any soap because it's upside-down? This is one of the things that was wrong with this bathroom. Since the place was vacant when we got it, it had been winterized by the friendly HUD folks. Not sure who did the painting, but it was a single yellowish-white color on everything. Looked like a spray job. 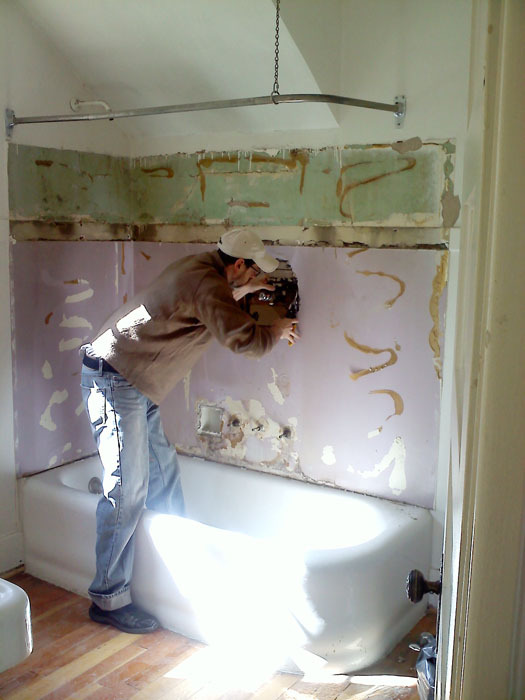 After yanking out the disgusting plastic paneling we needed to prep the walls for tile, which meant removing the damaged plaster. 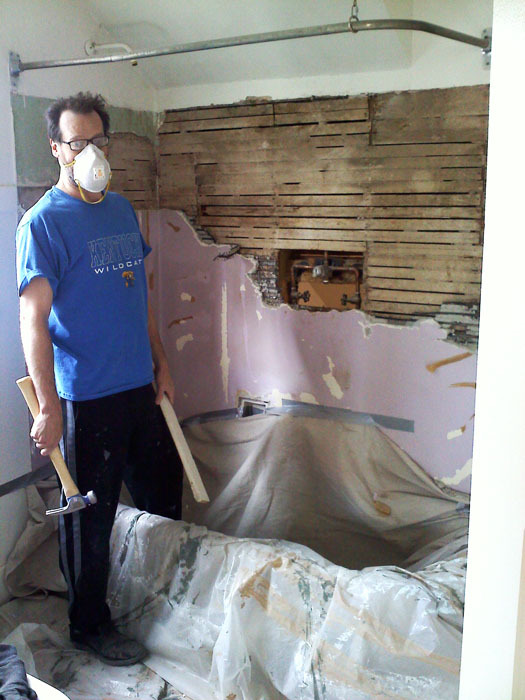 Our tile guy, Tim, was a gem to work with, and he let me do the demolition. I love demolition. 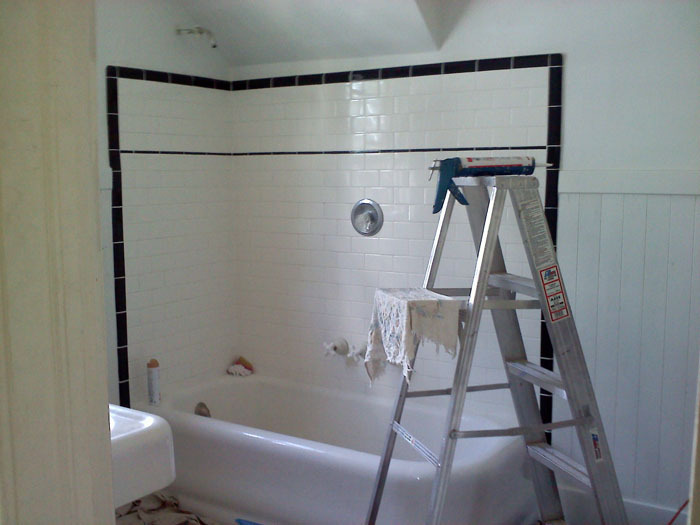 Here's what I thought going into the project: I'll rip this plaster down, then the tile guy will come in and tile. Easy. Days later, I'm still busting my hump trying to pull this godforsaken plaster down and I'm thinking it might be best to just wall off the damn bathroom and just start using a bucket and the outdoor hose for washing off. 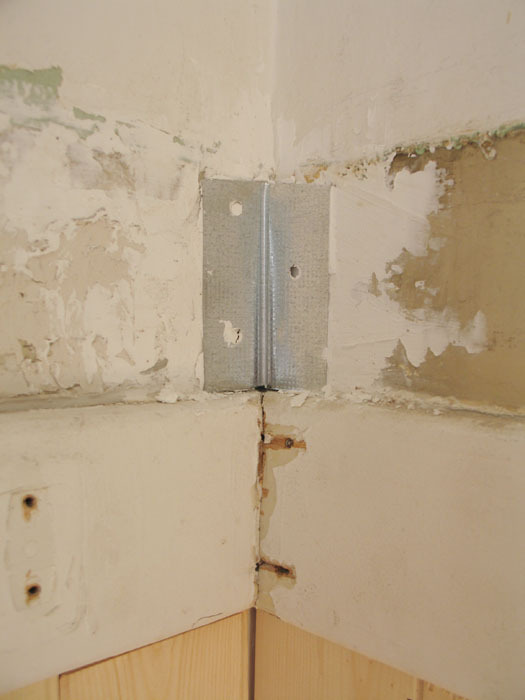 The problem, it turns out, is that this plaster has some kind of steel mesh that can't just be pulled down. 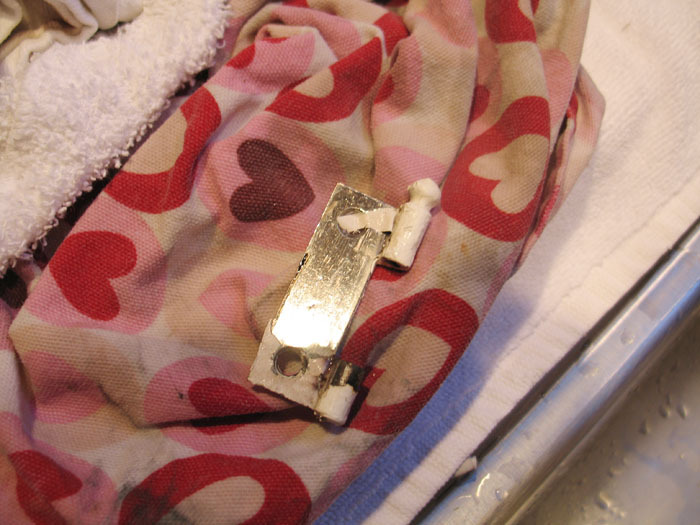 It has to be cut with a grinder and pried off. Miserable. This stuff right here. Steel. Or something. Whatever. Might as well have been titanium. The plaster on this stuff was virtually impossible to take down. Took days. I cursed a lot and cut myself on it no fewer than eight times. A tip for anyone thinking about taking this kind of project on: Rose-pruning shears work really well on this, but there are people who object to having her fancy rose shears being ruined on steel mesh. FYI. It occurred to me pretty soon after starting the demo that Tile Guy Tim knew exactly how awful this was going to be and "worked with me" on the demo because he knew our budget was tight. Well-played, Tile Guy Tim. Well-played. After the tile job. Looks pretty good with the circa. 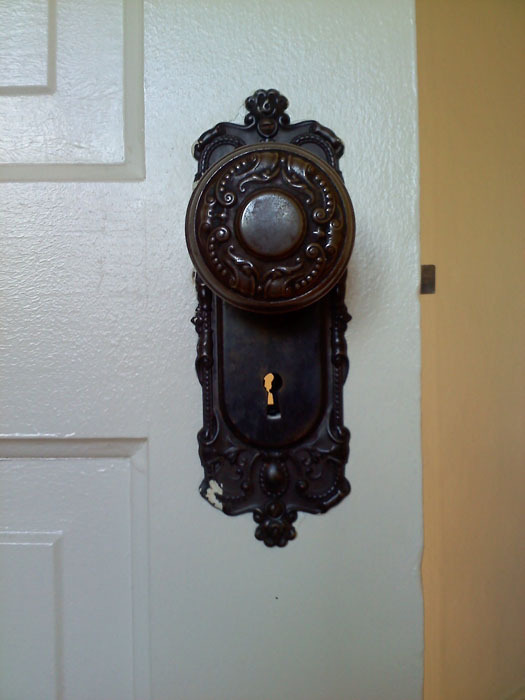 1920s fixtures, I think. 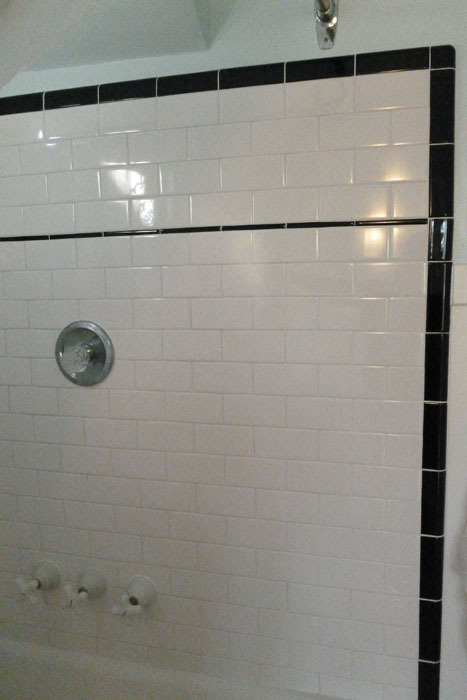 There was a lot of consternation about whether to put the thin black liner tile there, but after a LOT of discussion, we think we made the right choice. Tile Guy Tim doesn't have a website. If he did, we'd share it with you and recommend his work. Despite his skillful avoidance of the demolition, he was really great to work with: showed up on time, every time; answered calls; put up with someone's changes of heart about very small things; worked quickly and cleanly. And affordably. He went with us to the tile place to look at some options. A-plus transaction. Would hire again. If you need a tile guy, we still have his number. Why he doesn't have a website is a mystery. Come on, Tim, get on that. Because the beadboard came in 8-foot pieces, we moved the trim down to 4 feet so we could just cut the slats in half and save a little cash. 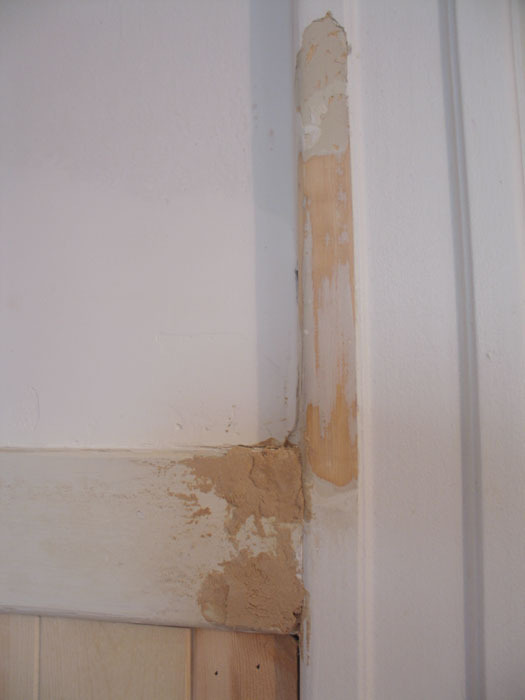 Of course this also meant that we had to repair some damaged plaster under the old trim. 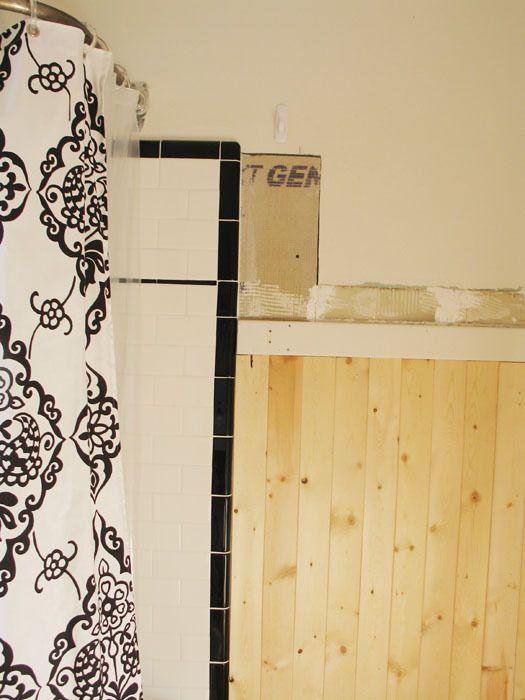 And by the shower, there was a section of Durock cementboard that needed some attention. I used my supersuperior ingenuity to repair this damaged corner by using metal cornerbead and then just mudding the hell out of it. Genius! There were some spots, too, that needed some wood putty. Another profoundly damaged corner? Cornerbead!! The beadboard was fairly easy to install. Adrienne's dad did most of it, and I stood around a lot talking about things he's not interested in. While we were doing all this work, we figured we might as well raise the sink a few inches so the taller people in the house don't have to hunch over it uncomfortably when we need to wash our hands. 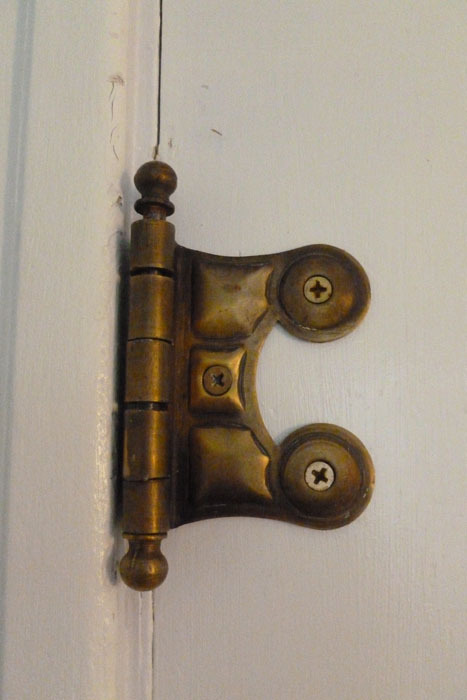 Didn't realize you could just unbolt the bracket from the wall, move it up a few inches, and reattach it. If I had known how easy it was, I would have been raising sinks all my life at every house I've ever lived in. 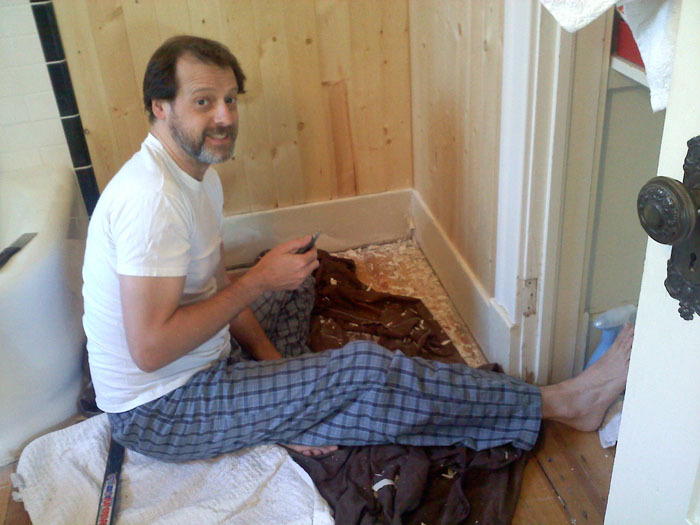 I find that the best carpentry is done in pajamas. 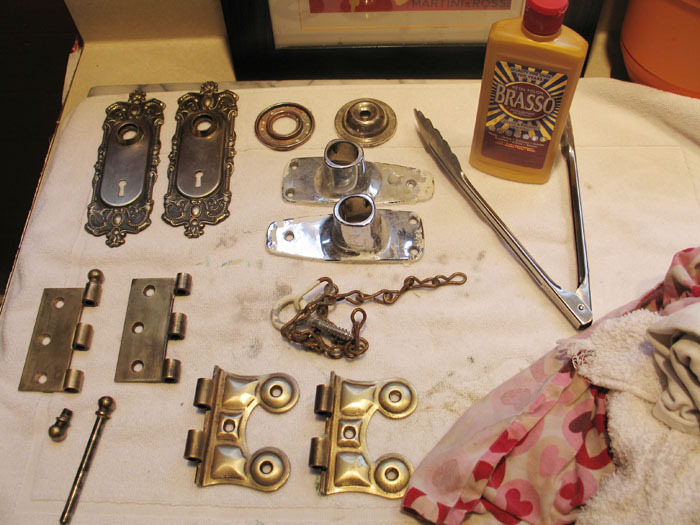 While I was painting and installing beadboard, Adrienne was cleaning and polishing all the hardware. 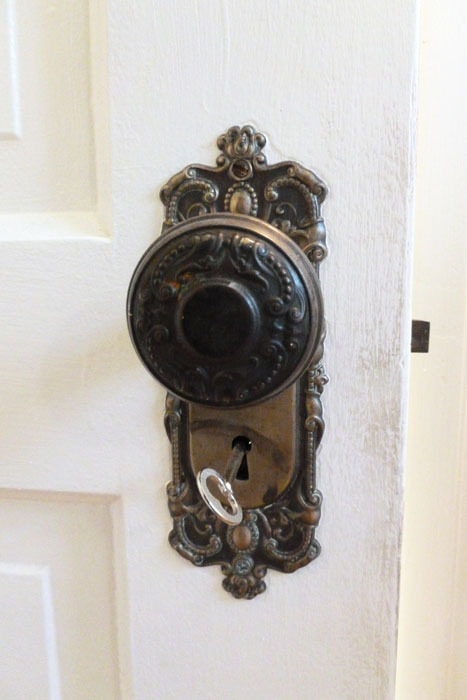 Here's a doorknob and plate before cleaning. Here's one after cleaning. Still has a good amount of patina, but some of the details are coming out more. Also, thanks to Henley's Keys downtown, we have a skeleton key that works! 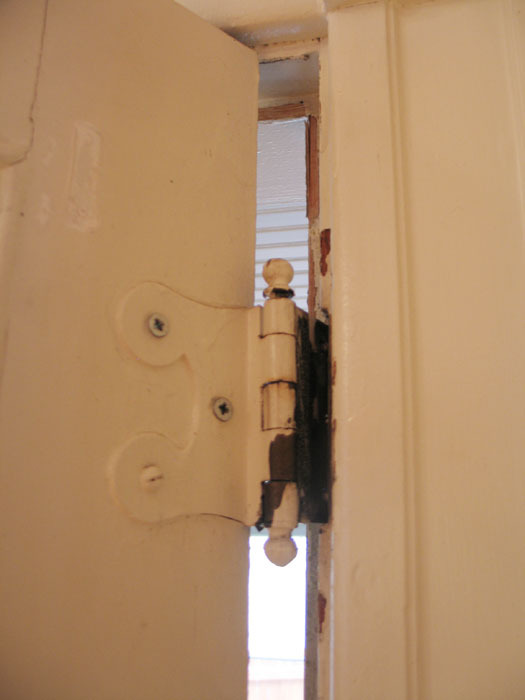 A "Before" hinge, showcasing one of my biggest peeves: Homeowners, please stop painting over hinges. Really, knock it off. See, doesn't that look better? Of course it does. 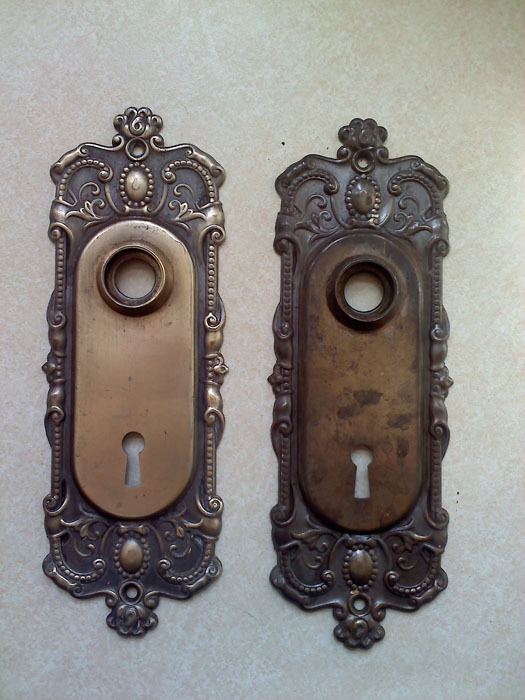 Keyplates before and after. Not too shiny, but not too grungy. Just right. 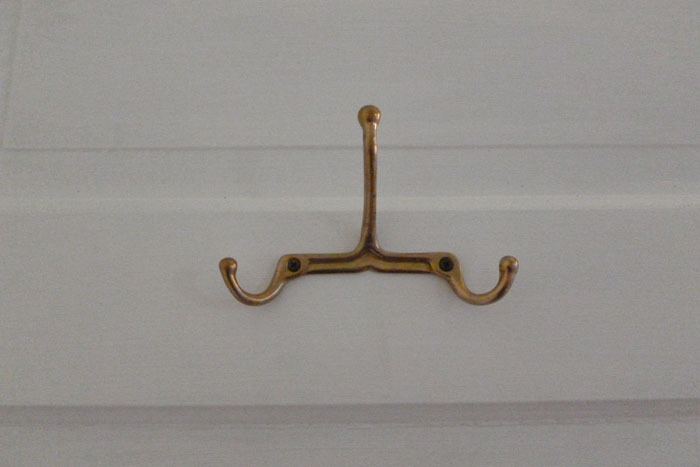 Finding good vintage brass hooks is a lot harder than it sounds. Took us forever to find these damn things. This is my favorite hook. It's on the back of the door. It's a sad realization in life when you see it in writing that you have a favorite hook. 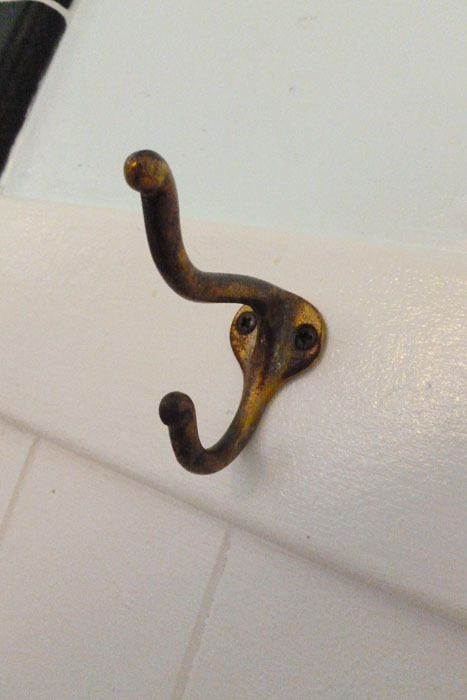 And here's my least favorite hook. We don't like it because it's weird. But since we won't be living here much longer, we put it up as a sort-of jab to the next owners. 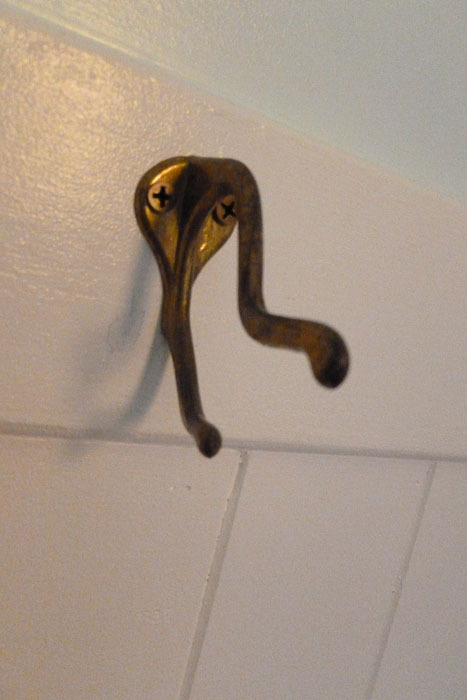 Take that, next owners: That's right, a weird bathroom hook. How are you liking your dream home now? After the painting and the putting back together of everything, the bathroom does look much better. 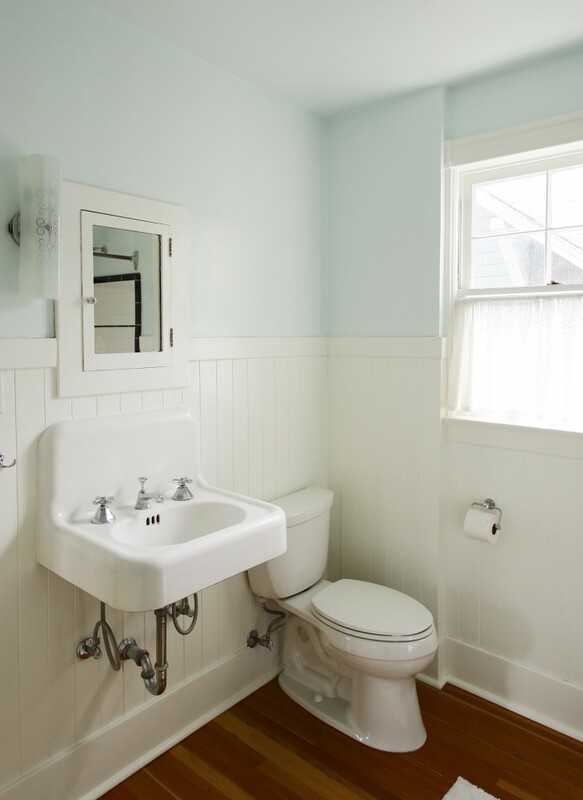 We used Benjamin Moore paint (Cottonball for the trim and Icing on the Cake for the blue walls). 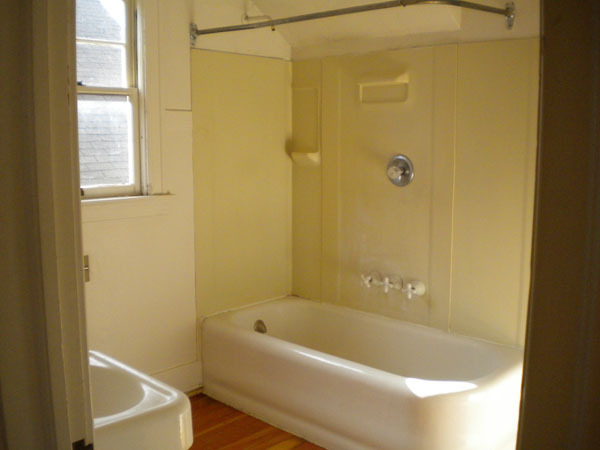 The finished bathtub/shower area. Thanks, Tile Guy Tim! Got a cute shower curtain from TJ Maxx and we were done. So there it is. 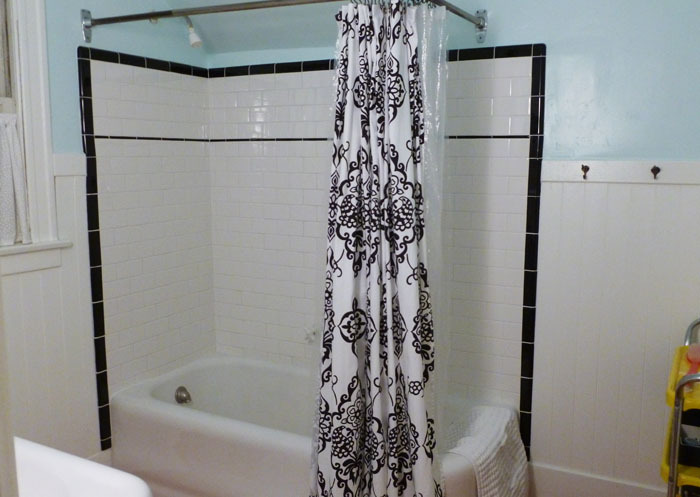 Our bathroom, finally finished. 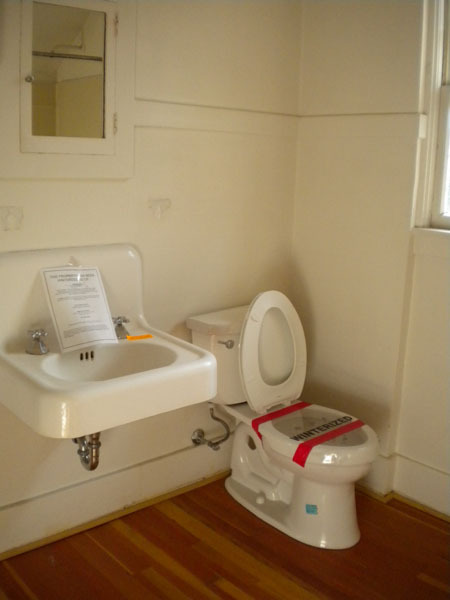 Only thing missing now is a toilet paper holder. We love this one, but I can’t spend $245 on a toilet paper holder. It’s just not right. 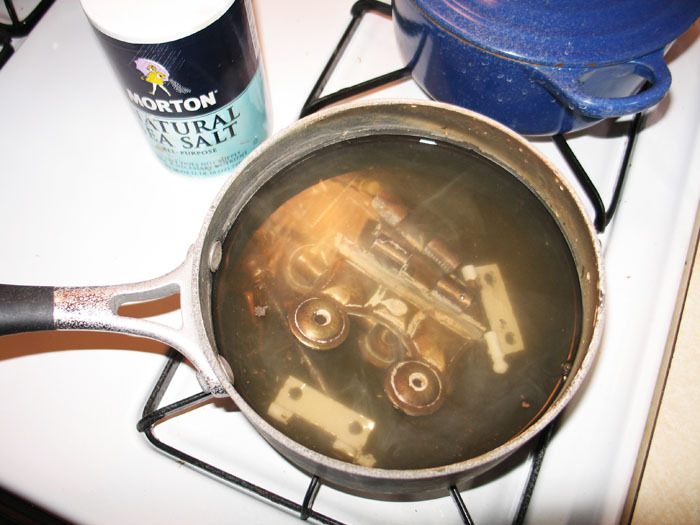 So I saw on the internet that you can strip paint off of old hardware with boiling water and salt. WHAAAAAAAAT? Still I decided to try it. You know what? It totally works. It’s non-toxic and way less messy than using stripper. I forgot to take a "before" pic of the hinges, but they were covered in paint like these other ones we have. Not as much paint on the strike plates but there was a lot of oldness on them. I put maybe 1/4 cup of salt into this little pan (use an old one cuz you won’t want to use it for cooking ever again) filled with water. You can adjust the amount. Be sure to stay nearby because the water boils away pretty quickly. I learned that the hard way. The paint softens up pretty quickly. 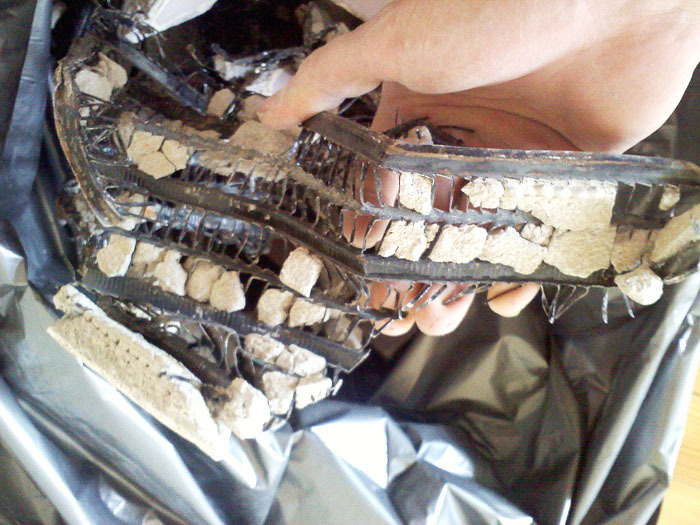 Then you will need to rub/lightly scrape it off. I used the best tool- my fingernails. You won’t want to do that if you have a pretty manicure. Maybe try some fine steel wool, or even just a rag. 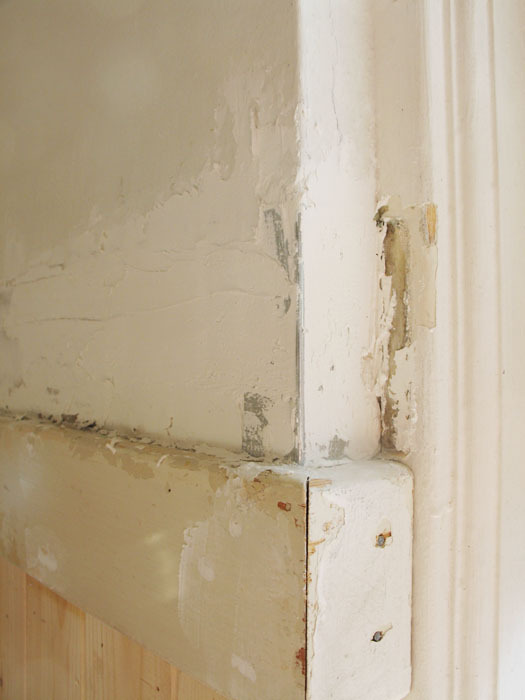 Stripping paint off old hardware with boiling salt water. After stripping the paint, they needed a little bit of metal polish to shine them up. I didn't polish them too much because I like the old patina. The before is on the right and the after is on the left.